The success of design sprints have proven results for large and small teams alike, irrespective of the size of your business. Up until recently, sprints have mostly been relegated to design and development (dev) teams, forced to convene and bash heads together to deliver realistic planning and deadlines. Lately, design and dev sprints cover broader scope with growth hacking, sprint-styled workshops. As the name suggests, growth hacking sprints combine hacking growth with sprint or growth-driven design methodology and are aimed at a run time of one and a half hours per workshop. Coined by Sean Ellis in 2010, growth hacking refers to the principle of assigning growth as your apex goal and gearing every task to achieving growth across all metrics. A growth hacker could be a marketer, designer or developer the only factor that differs in their focus. A growth-hacking sprint workshop focuses on internal projects your teams are running and the execution of daily tasks within your business, all with the aim of achieving growth within a realistic time constraint. Best of all projections and turnover time is less than half that of traditional sprint workshops. Being a marketer and lead generation specialist, I was excited to be invited to sit in on our design and dev team’s first growth hacking sprint workshop run by our ace designer, Robert Smart. “What I like about the design sprints is that it’s a super structured way to come up with a solution to an existing problem your company faces. 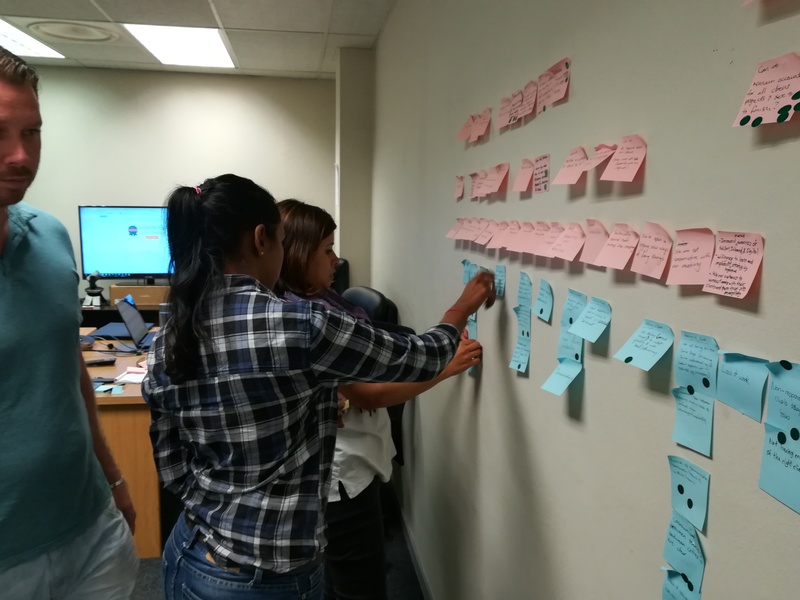 Everyone gets to contribute towards finding a solution, by coming up with a four-to-six week growth experiment to test a theory which helps to spur growth”, notes Robert. I was asked to join and offer a marketing angle to our template design projects. True to Robert’s word, we were in and out of our workshop in under two hours. But more importantly, we had some solid solutions and projects in place that could almost immediately be added to our game plans and divided into tasks. I gained so much value from this workshop that I insisted that Robert conduct one for our marketing team as well. The marketing workshop followed the same outline, yet I struggled to see any similarities between the teams’ responses or results. My finds are that the efficacy of the workshops are applicable to any team or pod within your business and benefits each team differently. Acquisition - How do your potential customers find you and find out about you? How do they get in touch? Activation - How do you turn your potential customers into paying customers – or not necessarily paying but active? What's your conversion rate? Retention - How do you keep your customers coming back or re-engaging? How do you increase their customer lifetime value (CLV)? Jia Wertz of Forbes sites Frederick Reichheld's research for Bain & Company, and explains that a 5% increase in customer retention can lead to an increase in profits of between 25% to 95% - with this statement in mind, it's easy to see the importance of keeping your customers delighted, spreading the word, and coming back for more. I sat down with Rob to map out his process and outline for the growth hack sprint. 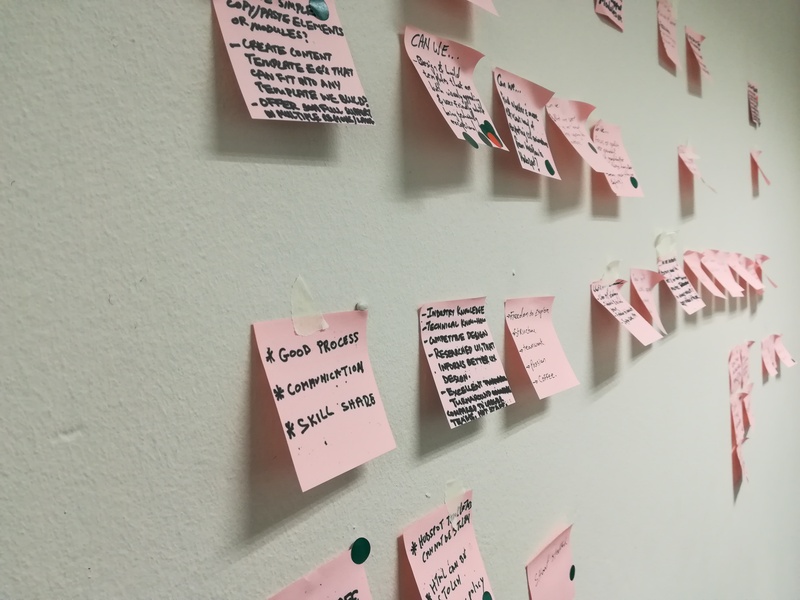 Borrowing heavily from Berlin-based design agency AJ&Smart’s workshops and documented Sprint and Growth Hacking books, Rob tweaked his growth sprint accordingly. The 10 steps below demonstrate how you can perform this workshop within your office. Ensure that you're within your time constraints of under two hours - added is a recommended time limit for each step to help frame your time expectation for each task's completion. Thinking about Acquisition/Activation/Retention - your assigned facilitator introduces these concepts and discusses which tasks quantify each of these sections. They then introduce a sailboat exercise where everyone discusses what pushes your business forward. Ask what the wind in your company’s sails is and breakdown those positives. E.g. Acquisition – Blog posts bring in new clients / Activation – Most leads become customers / Retention – Clients stay for years. Each person works individually and writes down on a sticky note what they deem to be the best push for your business growth. Once completed, everyone sticks their choice on the board/wall, and each attendee takes a turn to explain their choice. Everyone then gathers and votes on what they deem to be the most applicable answer. Conversely step two deals with what’s anchoring your sailboat (business) or holding you back from achieving your goals? E.g. Acquisition – The business relies too heavily on recommendations / Activation – It takes forever to close deals / Retention – Clients don’t need us once our projects are finished. Once again, everyone works individually to write down their opinion on what may be an obstacle to the business. No one should be allowed to talk or brainstorm together, as every opinion should be their own. The facilitator then collects these and groups them into acquisition, activation and retention segmentation, and again everyone takes a turn to vote on what they deem to be the most pressing or prevalent issues in each group. The highest voted issue needing to be solved for in an exercise is called “how might we”. How might we, or HMWs, looks at your sailboat anchor issues, and challenges your workshop to turn this negative into an opportunity. HMWs are a chance to identify an issue the business faces and collects ideas that may help solve these problems. The facilitator here tasks the group to answer the question, “How might we solve for X?”. E.g. Acquisition Anchor – We rely too heavily on recommendations to get our clients. HMW = How might we find alternative ways to gather clients that are not only based on recommendations, or word of mouth? Again, the workshop votes and the facilitator collects the ones with the most votes and places them on the board in order of most votes to least. The facilitator now creates a map of the company by documenting your business funnel from left to right and the actions taken throughout each of these. This overview of the company from acquisition to retention should range from when a user first makes contact to when they make a purchase and become a lifelong ambassador. 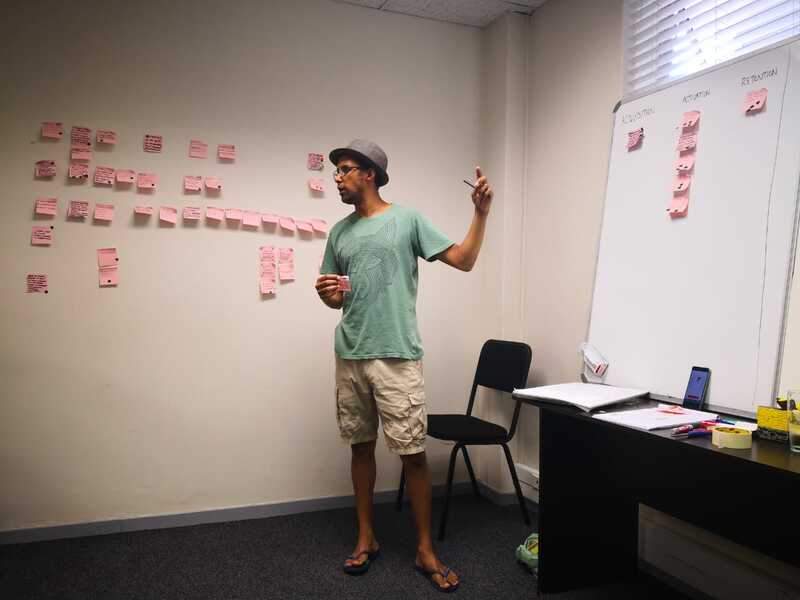 The facilitator then sticks all the HMWs to the map of the company where the solution fits. A cluster will begin to form as you identify where most of the problems in your company lie. With HMWs in place, some solid solutions quickly become apparent. The next step is rather exciting. Your lightning demo (a technic used by AJ&Smart and documented in detail in their Sprint book) isolates the most pressing sticky points in the areas of your business that are most affected. The facilitator checks to see where most points have been raised in the group, and where in your funnel these are sitting. Your facilitator gathers up all the HMWs under the affected lever (e.g. acquisition) with the most issues. To conduct the lightning demo, the facilitator sends away attendees to work alone on researching companies that have dealt with similar problems and found a solution. Attendees can use their personal laptops, smart phones, or whatever is provided by the organisers to do their research. Your company map can be left up and consulted later as the idea is to tackle one section at a time at each workshop. (Few Extra Bits) Aim to focus heavily on copy / Create more tailored “sales funnels” / Better help customers find what services they need or are looking for. Each person has one to three minutes to present their solutions to the team. They should be guided to share what they found and explain why they think it’s interesting and applicable. They then stick their examples on the board. This exercise helps show what other companies in your industry are doing successfully and to identify solutions your company may not have thought about to solve your problems. Everyone walks around with their notepads or sticky notes and jots down points from all the ideas and steps gone through so far. The aim is to pull out important points that stand out to them. These ideas will help formulate the next important step – conducting their growth experiment. Explain why it will work. Explain how it will be executed. Show how we will know it worked (your benchmarks and KPIs). Note how long it will run for? Create custom landing pages for our top three buyer personas and use AdWords to drive customers to these pages. Each page will have a contact form. The aim is to reduce confusion around services to provide and increase lead generation. The facilitator encourages attendees to look at the issue one more time and refer back to the HMWs along the company map. Then to go ahead and create their growth experiment. Once all experiments have been created, they are lined up on the wall. Each attendee reads through them carefully and casts a vote on what they think is the best and most realistic experiment to solve for the issue. They place their initials on their sticker and, once the facilitator counts down, everyone casts their vote simultaneously. Once all votes are cast, the facilitator immediately sets aside experiments with NO votes at all. Attendees each take a turn to stand up and explain why they voted for the experiment they did. 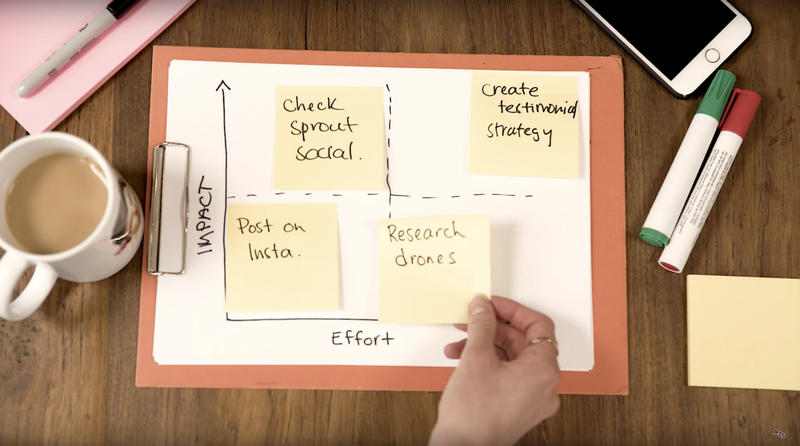 An effort/impact scale is then drawn up to measure which of the experiments will offer the most value, or impact with the least effort to execute. The facilitator draws a graph documenting impact and effort on each axis. Sticky notes with the experiment names get placed in the middle of the scale and attendees talk through each experiment assigning impact and effort to each. Impact is judged by raising or lowering the note on the scale, while effort is judged by moving it from right to left. E.g. Any of the experiments that sit in the top left, should be prioritised as a DO IT NOW. Top right position placing means you could MAKE A PROJECT – you might not be able to tackle it right now. A bottom left means you can MAKE A TASK – this may be something small to tackle in the future. Bottom right means FORGET FOR NOW – this may be a hard pill to swallow for some attendees but focus for these tasks should be on efficiencies more than anything else. Once the team has identified which experiment is more appropriate based on the effort and impact, the next step is to create task in your account or project management software tools. Use something like Google, NorthStar, Accelo or Trello to map out, track and measure your experiments/tasks. We use HubSpot to execute all our marketing and with the use of a campaign tool, gather and track all our efforts in the all-in-one CRM platform. The HubSpot platform gives enough visibility to track our experiments, conduct A/B testing and create a personalised SMART approach. Once you’ve successfully conducted your experiments and drawn conclusions, you can refer back to the other experiments on your workshop’s effort/impact scale and assign tasks. Alternatively, you could conduct another growth hacking sprint workshop, and once again assign a facilitator and decider to run it. As a guide, your company map should always remain visible so your teams can monitor progress of all your workshops and possibly uncover more pain points to improve upon and solve more issues. 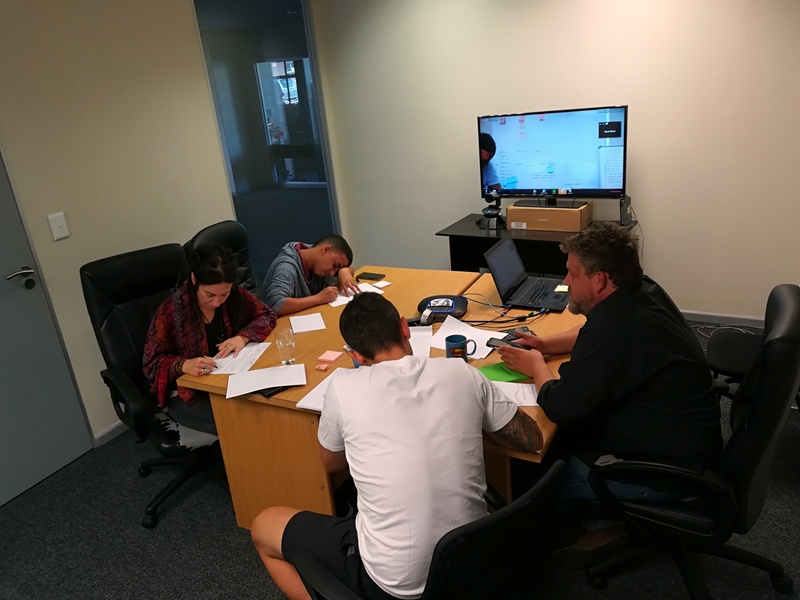 As for Struto, our design and dev, as well as marketing pods are already hard at work with our very own experiments and are all ticking off tasks assigned. We’re seeing quick wins from low hanging fruit in our task execution and have consequently realised a heightened team morale.